Lighted “Buzz” sign on distressed wall; image by Karolina Zuraw, via Unsplash.com. It’s 2019, and all companies want to go viral. They are looking for the viral content and viral strategies that will help them get as much attention and recognition as possible. Although everyone knows examples of companies and products that went viral and brought millions of dollars to the people behind them, creating buzz isn’t an easy task. The reason is obvious — everyone wants to create buzz, not only you. The statistics are striking: We see 4,000 to 10,000 marketing messages every day. Thus, if you want to be noticed, you should produce a lot of advertising materials. Companies that seek attention quickly realize that the traditional marketing approaches won’t bring the desired result. That’s why they turn to buzz marketing — a method which implies sending 100 or even 1,000 times more messages than usually, bombarding users with your brand. However, the volume of marketing materials is not the only feature of this approach. The main principle of successful buzz marketing is providing the right content at the right time and the right place. We decided to help you choose the right strategy for your buzz marketing so that you can increase your sales in no time. The main idea of buzz marketing is making people talk about your product and your company. Not only do you need people to share your posts on social media, but you need them to mention your brand when meeting with friends or having a coffee break at work. Buzz marketing is more than just building brand relationships and increasing brand awareness. Simply put, it’s a combination of word of mouth marketing and viral marketing. The main goal is to make people talk about your brand, therefore, you need to give them something worth talking about. People talk about many different things, but some topics are hotter than others, sparking conversations immediately. Be controversial. When your content is controversial, it creates buzz. However, you should understand how to use this approach correctly. Your position regarding a controversial issue should be well-researched and based on solid arguments. In addition, you should explain why this issue is important for the audience — it should be relevant. You should choose a topic that will make people dispute and argue about it. In addition, no matter how controversial and edgy you are, make sure not to cross the line after which you’ll create enemies. 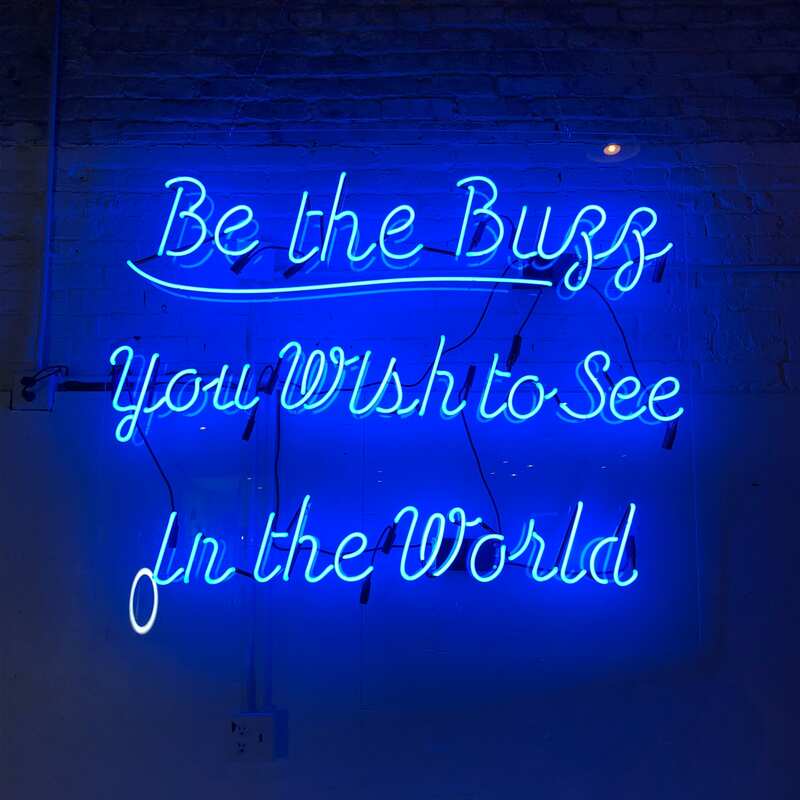 Neon blue “Be the buzz you wish to see in the world” sign; image by Tanya Santos, via Unsplash.com. Be Odd. Another good way to create buzz around your brand is to do something strange. People are curious and they immediately share information on any weird things they cannot explain. A good example of a bizarre marketing solution was GoldToe’s decision to dress the Wall Street Bull in men’s briefs. This campaign aimed to attract attention to Fashion Week New York made people share posts and talk about it because it looked absolutely ridiculous. Be Remarkable. Of course, doing weird things is not the only effective way to get attention. For example, you can just offer a remarkable service or product. When people buy something ordinary, they don’t talk about it. On the other hand, when they get something outstanding, you get not only a lot of attention but also the exact right kind of attention because it’s based on the quality of your brand. For example, Zappos allows buyers to return their clothes and shoes within 365 days. In addition, they offer awesome customer service. This is the most honest way to make people talk about you. Create Scarcity. In marketing, the principle of scarcity implies intentionally creating an imbalance between the supply and demand for your product or service. For example, you can use flash sales — short-term promotions and discounts offered by eCommerce stores. Flash sales, as well as limited offers, and ‘use it or lose it’ offers quickly increase demand and create buzz. Be funny. First, keep in mind that funny content is difficult to use in business. On one hand, it will make people talk about what they’ve seen. On the other hand, they should not only remember what is funny about your advertising but also remember your brand as well. A good example of a funny campaign is Toyota’s Swagger Wagon video. Everybody understands how hard it is to make minivans look cool, so Toyota decided to make a clip where parents and their kids are rapping about how swaggy their wagon is. The video quickly went viral and boosted the popularity of Toyota. If you want to boost brand awareness and to make your brand memorable, buzz marketing is what you need. Be funny, be provocative, or just be the best in your niche and make people talk about your brand. At the same time, we suggest not choosing too extreme solutions that can drive people away from your brand. You also shouldn’t limit yourself to one of the strategies above only. Combine them and use different approaches at the same time. You should understand what kind of buzz is the best for your brand. Don’t be afraid to experiment, and buzz marketing will help you achieve your marketing goals.